Finally, a place I can answer all of your questions about VIPKID! I have been a teacher with VIPKID since last August and I still absolutely love it. I get asked almost daily about my job and I'm happy to share my experience. It can be difficult to find employment that will allow you to set your own schedule and work from home for decent pay. This has been one of our biggest blessings since we decided to do this baseball life together and I know it will be the perfect fit for others as well. VIPKID is the leading online education platform for children in China to learn English through teachers in North America. 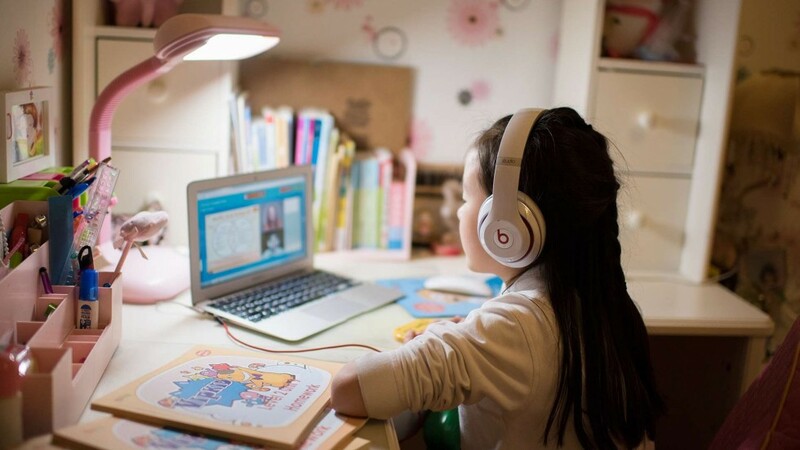 VIPKID's mission is to provide the North American elementary school experience to children in China between the ages of five to twelve years old, all from the comfort of their homes. Headquartered in Beijing, the company offers fully immersive one-on-one English language instruction provided online by the world's most highly qualified teachers. Curriculum is aligned to U.S. Common Core State Standards and uses a flipped-classroom approach to foster creativity and critical thinking skills. To date, VIPKID has over half a million registered users. Yes. I had the same question when I first heard about it. To save you from having to dig as much as I did, let me leave you with a few things that made me realize how legit this company is. VIPKID is ranked #1 on Forbes top 100 work from home companies. You know it’s legit if Forbes backs it! Kobe Bryant also recently invested in VIPKID which is pretty darn cool. The investment in VIPKID marks Kobe Bryant’s first ever investment in education, as well as his firm’s second investment in a Chinese company. I’ve been with this company over 6 months and I haven’t had any issues with payment or personal information. Each class is 25 minutes long with 5 minutes in between to leave feedback (if you are booking back to back classes.) Each student is learning material that caters to the level they are currently in depending on how well they know English. There are days where I teach 8 classes that are all different and then there are other days I teach the same exact lesson three times. You can see the student and the student can see you once you are both in the classroom (like Skype or FaceTime.) You can also both see the course material which you can draw on. The material is like a PowerPoint where you can go to the next slide or back to the previous slide. There is also a timer in class so you can keep track of how long you have left. Some students can speak English extremely well and you can have full on conversations with them. Other students are just learning how to say their name and the letters ABC. It is fun to have such a variety of learning throughout the day to keep things interesting. 4. Do I have to have a teaching degree? A teaching degree and/ or teaching experience is not required to apply for VIPKID. You do have to have a 4-year degree of any kind. I always recommend listing as many things as you can under experience that could translate to working well with children. This can be anything like coaching or training at previous jobs. 5. Can I take days off? Yes! You really do set your own schedule. I have a portal I enter through my VIPKID app and I only open the time slots I want to work. If I want to take three days off, I just don’t open any classes for those three days. The company does ask that you give them a heads up if you will be taking off for two weeks or more. 6. What hours can you work? In Peoria Arizona, the hours that I can work are from midnight to 7am and then again from 6pm- 11:30pm. I can open as many slots as my heart desires during those hours. Keep in mind just because I open slots, doesn’t necessarily mean those slots will all be booked. 7. How many students are in the class? For regular master classes, it is always one on one with the student and teacher. For trial classes, they do allow more than one student (usually a sibling) to be in the class. The trial classes are all about having fun and welcoming the kids to VIPKID so having more than one student isn’t a big deal for the trials. Very rarely do I see more than one student in my trial classes but when I do my goal is to try and make them feel so comfortable that they want to come back. 8. How do you make the course material? The teachers do not make the course material. The company provides every lesson, all you have to do is review it before you teach it so you are prepared. I have taught so many classes at this point that I hardly ever have to review the lessons because I’ve taught most of them already! 9. What is the interview process like? The interview process seems lengthy but there is a method to the madness. As soon as you get hired with VIPKID you are ready to start teaching solo. The interview process doubles as training and making sure you are prepared to teach on your own. It has changed a little since I was hired but when I went through the interview process I had to apply for it, do a 10-minute demo interview and then two, one hour mock interviews. I know they now have other options for people to not have to do one of the mock interviews but my understanding is that isn’t available to everyone. 10. How many hours do you work? It depends on where we are living and what we have going on. Last month (February) was the most I’ve ever worked in a month teaching almost 200 classes. This month I won’t be opening as many time slots due to launching my website, spring training and the number of visitors we get. Below is an example of a "busy" week for me. 11. How much do I have to interact with the parents? The teachers are required to leave feedback after each class and the parents are able to leave feedback for the teachers as well. Other than that, there have been a few times a parent will pop in and just say hello or ask a quick question. So, to answer this question, VIPKID is the middle man the majority of the time. 12. Do I get paid if I refer others to VIPKID? 13. What is the hardest part about VIPKID? The hardest part is not always knowing exactly how many bookings you will get each week as well as having to time your lessons correctly. The students aren’t always placed into the correct level so you have to adjust and modify on the go. That gets much easier with time. For the most part, I book all of the time slots I open now but that wasn’t always the case. I know there are people who really struggle to get bookings at all within the first few months so keep that in mind if you are needing something with a guaranteed paycheck immediately. Bookings will come, but the amount and how fast you book after you get hired is different for everyone. 14. How do I apply? Please let me help you get this job! I would not have been hired by VIPKID if it wasn’t for my mentor. I will personally send you videos that will show you my teaching methods and exactly how I passed. If you would like to apply, please use my referral link below and I will gladly help you through the process. Welcome to The Baseball Gypsy! Come hang out with us!